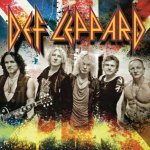 Def Leppard played a show in Uppsala, Sweden on 3rd July and a fifth online review and photos have been posted. The Daily Madman blog has posted a review of the show which took place at Vaksala Square. 1 photo is also included. "And the sound. THE SOUND. I don’t think that I ever been to a concert with such high quality on the sound. And this was an outdoor concert and I was way back in the audience…"